17' 2" telescoping Flagpole - Strong Aluminum; Rust and Corrosion proof; Compacts to less than 4' for easy storage in any vehicle. Ideal for any vehicle - including RV's, cars, trucks. Sturdy design accepts the telescoping flag pole. Simply place on the ground and drive onto it. 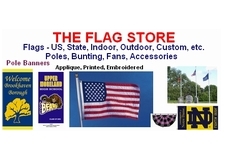 Drop the pole in and your ready to tailgate with your teams colors flying high. Two piece design allows for small space storage. Pipe screws into the flat steel base. Thumbscrew secures pole in holder. Easy up - easy down. Hitch Mount - can be mounted on any vehicle with a 2" receiver hitch. Item is reversible to accommodate a rear mounted spare tire or a lowered truck tailgate.